Main purpose of this term paper is to analysis and discuss on Consumption, Saving and Investment, he Trend Analysis for Bangladesh. This report analyses various aspects of the economic climate of Bangladesh, taking into account economic growth and quality lifestyle, inflation, unemployment, consumption, personal savings, investment, balance of check and monetary and economical policies. Bangladesh, a country of more than 140 million people, is one of South Asia’s least developed countries. Bangladesh has an agrarian economy with 22% of GDP coming from the Agriculture Sector. Major agricultural products are rice, jute, wheat, potato, pulses, tobacco, tea and sugarcane. . The country is the largest exporter of jute and jute goods in the world. Readymade garments are among the most exportable items. Tea, frozen shrimp, fish, leather goods and handicrafts are also major exportable commodities. The country has under gone a major shift in its economic philosophy and management in recent years. At Bangladesh’s birth, the country embraced socialism as the economic ideology with a dominant role for the public sector. But, since the mid-seventies, it undertook a major restructuring towards establishing a market economy with emphasis on private sector-led economic growth. Bangladesh achieved good economic progress during the 1990s by adopting a series of structural and economic reform measures. The stabilization program reduced inflation as well as fiscal and current accounts deficit and established a healthy foreign exchange reserve position. Economic performance improved with gross domestic product (GDP) growth averaging 5 percent in the 1990s compared with 4 percent in the preceding decade. The acceleration in economic growth was accompanied by decreased incidence of poverty and a distinct improvement of some key social indicators. Rapid growth in food grain production has been a remarkable feature of the country’s economic performance in recent years. In FY2000, Bangladesh reached self-sufficiency in food grain production. A combination of factors accounts for the robust growth of the agriculture sector, and in particular of food grains. According to a World Bank estimate, Bangladesh has the 36th largest economy in the world in terms of GNP based on the purchasing power parity method of valuation, and the 55th largest in terms of nominal GNP in U.S. Dollars. This report analyses the various aspects of the economy of Bangladesh, taking into account economic growth and standard of living, inflation, unemployment, consumption, savings, investment, balance of payment, and monetary and fiscal policies. Economic Growth is defined as the increase in value of the goods and services produced by an economy. It may also be defined as the outward shift in the production possibility curve. It is conventionally measured as the percent rate of increase in real gross domestic product, or GDP. The GDP figure is inflation adjusted, by netting out the level of price changes in the economy, thus a more reliable figure of output change may be deduced. Gross domestic product (GDP) is used to ascertain the level of growth in the economy. It is very crucial to minimize statistical and survey error in calculating this figure. GNP (Gross national product) is another measure which is used interchangeably with GDP for economic growth calculation purpose. GNP is calculated by adding to gdp, the income earned by residents from abroad, less the corresponding income sent. For semi developed South Asian countries like Bangladesh, India and Nepal, economic growth through rise in GDP is not absolute and in many cases misleading too many. This is true due to existence of widespread poverty in these countries. This results due to polarity of wealth and inequality in the distribution of income. In order to properly assess the level of economic growth various Human development index e.g. Sanitation rate, literacy rate, life expectancy rate etc should be examined along with growth of GDP. Another concept of Economic development, therefore, must be introduced to better explain development and growth in the South Asian countries. Economic development is a sustainable increase in living standards that implies increased per capita income, better education and health as well as environmental protection. The economic growth concepts successfully incorporate and assimilates core economic concept of GDP rise with social welfare. This also helps to bridge the gap between pure and welfare economics. Economic development through GDP rise and improvement of infrastructure reaffirms the vision of growth contributing to the welfare of the population. Human Development Index (HDI) The human development index (HDI) focuses on three measurable dimensions of human development: living a long and healthy life, being educated and having a decent standard of living. Thus it combines measures of life expectancy, school enrolment, literacy and income to allow a broader view of a country’s development than does income alone. It was developed in 1990 by Pakistani economist Mahbub ul Haq and has been used to aid calculation of economic development. Various agencies like IMF, World Bank tend to focus on economic development rather then economic growth, especially for developing countries like Bangladesh. The Human Poverty Index for developing countries (HPI-1) focuses on the proportion of people below a threshold level in the same dimensions of human development as the human development index – living a long and healthy life, having access to education, and a decent standard of living. By looking beyond income deprivation, the HPI-1 represents a multi-dimensional alternative to the $1 a day (PPP US$) poverty measure. The Gini coefficient is a measure of inequality of a distribution, and can be used to measure income inequality. It is defined as a ratio with values ranging from 0 to 1 with the numerator being the area between the Lorenz curve of the distribution and the uniform (perfect) distribution line; the denominator being the area under the uniform distribution line. When used as an income inequality metric, 0 corresponds to perfect income equality i.e. everyone has the same income, and 1 corresponds to perfect income inequality i.e. one person has all the income, while everyone else has zero income. Consumption is the expenditures by households on final goods and services. In Macroeconomics, consumption is the total spending by a nation on consumer goods and services over a period of time. It is the largest single component of GDP. Consumption is strictly applied only to those goods or services that are used within the specified time period. However in practice consumption expenditures include all consumer goods bought, many of which last well beyond the specified period e.g. automobiles, clothes, furniture, etc. Major areas of consumption are housing, motor vehicles, food, and medical care. The Keynesian view of consumption is that when income increases, consumption rises, but by an amount less than the increase in income. In other words, consumption is dependent on disposable income. The newer theories of consumption differ from that of Keynes and are more deeply rooted in the microeconomics of consumer behavior. Two of the theories are: Friedman’s Permanent Income Hypothesis (PIH) and Modigliani’s Life Cycle Hypothesis (LCH). These are discussed later in the report. The “Break-Even” Point: At any point on the 45° line, the distance up the horizontal axis (consumption) exactly equals the distance across from the vertical axis (disposable income). The break-even point on the consumption schedule that intersects the 45° line represents the level of disposable income at which households just break even (100% income is spent on consumption). When the consumption function lies above the 45° line, the household is dissaving. When the consumption function lies below the 45° line, the household has positive saving. The amount of dissaving or saving is always measured by the vertical distance between the consumption function and the 45° line. In any economy, individuals have two ways to use income they can spend it or save it. Saving is the setting aside of income for future use and is undertaken by both individuals and institutions. If too much is spent and too little saved, the economy’s capacity to produce will be diminished. If, on the other hand, too much is saved and too little spent, there will be more money available for investment than can possibly be used and not enough people will buy what is produced. Investment, as defined by economist Paul A. Samuelson, is capital formation: “additions to the nation’s stock of buildings, equipment, and inventories.” Investment, therefore, is primarily the activity of businesses and is a way of using the money that comes from saving. The act of investing uses resources that have been freed from current consumption to develop goods or assets that will produce earnings or add to production in the future. Savings theories traditionally predict that current consumption is related not to current income, but to a longer-term estimate of income. The life-cycle hypothesis (Modigliani 1966) predicts that individuals hold their consumption constant over their lifetime; they save during their working years and draw down their savings during retirement. One implication of the life-cycle hypothesis is that a program such as social security, which supplements income for retirement, will reduce saving by workers since they no longer need to save as much for retirement. The permanent income hypothesis (Friedman 1954) argues that consumption is proportional to a consumer’s estimate of permanent income. The permanent-income theory implies that consumers do not respond equally to all income changes. If a particular change in income appears to be permanent, people are likely to consume a large fraction of the increase in income and hence, save less. The Saving Function saving function shows the relationship between the level of saving that households or a nation will undertake and the level of income. The disposable income is shown on the horizontal axis; but now saving is on the vertical axis. Graphically, the saving function is obtained by subtracting vertically the consumption function from the 45° line in Fig.1. Saving is the vertical distance between the 45° line and the consumption function. The household’s saving is negative below the zero-saving line because the consumption function lies above the 45° line. 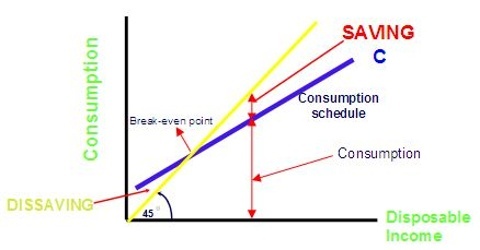 Similarly, positive saving occurs to the right of the break-even point because the consumption function lies below the 45° line and the saving function is above the zero-saving line. Investment is defined as spending over a given period on new capital goods (e.g. houses, factories, machineries, etc) or on net additions to stock (raw materials, consumer goods in shops etc). This definition covers gross investment. In other words, Investment is any use of resources intended to increase future production of output or income. If depreciation is deducted, we get the net investment. Investment may be domestic in nature, or may originate from abroad. The latter is known as FDI (foreign direct investment). Investment expenditures are commonly assumed to be totally autonomous in the introductory analysis of Keynesian economics. That is, any induced investment that realistically exists is ignored. In modern days, economists oppose this motion through their different empirical studies. Induced Investment is Business investment expenditures that depend on income or production (especially national income and gross domestic product). That is, changes in income induce changes in investment. According to many prominent economists, Investment expenditures are induced because business firms are prone to use profits generated by a growing, expending economy to finance capital investment. Autonomous Investment is Business investment expenditures that do not depend on income or production (especially national income and gross domestic product). That is, changes in income will not induce changes in investment. Other factors cause changes in the level of investment e.g. rate of interest, tax reforms, physical wealth, expectation etc. The following graph and equation will clarify the relationship between induced and Autonomous Investment. 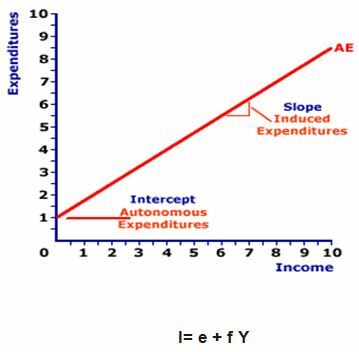 Where: I is investment expenditures, Y is income (national or disposable), e is the intercept, and f is the slope. As with any linear equation, the two key parameters that characterize this investment equation are slope and intercept. Induced investment is indicated by the slope of the investment equation. Autonomous investment is indicated by the intercept. Hyper inflation: It refers to extremely fast increase in price level, e.g. above 1000% a year. Seemingly, no government policies can curtail disparaging effects of hyperinflation on the economy. People’s purchasing power deteriorates sharply and currency loses its worth. In serious cases, people lose faith in their currency and engage in barter. Stagflation: This is a scenario where there is sluggish economic growth coupled with both high rates of inflation and unemployment. Stagflation is triggered by cost push inflation which increases production costs of good, thereby raising price. For example, a leftward shift of aggregate supply curve during oil price hike raised overall price level of products. Creeping Inflation: This term is used both for a rate of inflation that is low but even so high enough to cause problems, and for a rate of inflation that gradually moves higher over time. Creeping inflation refers to a steadily accelerating inflation rate, generally 1-6 % annually. Such inflation is worrying if the cause is higher costs of production. Then the economy is likely to suffer from increasing trend in unemployment rate. Suppressed Inflation: It is a situation where aggregate demand exceeds aggregate supply, but the effect on prices is minimized by the use of devices like price controls and rationing. Price levels are not allowed to rise, but shortage exists in the economy. Suppressed inflation was found in former communist countries like U.S.S.R. The causes of inflation are cost-push inflation and demand-pull inflation. Cost Push Inflation: Such situation occurs when prices of goods and services rise due to higher costs of production. When input costs rise, firms pass over the cost in the form of higher prices. For example, a rise in wage floor without corresponding rise in productivity impacts the price of goods. The ill effect of cost push inflation is wage spiral. Rise in price of goods will enforce another round of wage rise. This vicious cycle will keep on continuing. During wars when overemphasis on military goods cause a shortage of consumer goods. In countries with higher exports, where supply of consumer goods decreases. In a growing economy which devotes more resources to capital than consumer goods. Seasonal Unemployment: Unemployment caused because of the seasonal nature of employment – tourism, cricketers, seasonal labour in agriculture sector, etc. Frictional Unemployment: Unemployment caused when the workers are unemployed for the short length of time between jobs. Such as who are changing jobs, initially entering the labour force, or re-entering the labour force. Cyclical Unemployment: Unemployment caused by the economic performance or business cycle or due to insufficient aggregate demand or total spending. This exists due to inadequate effective aggregate demand. Structural Unemployment: Unemployment caused as a result of the decline of industries and inability of former employees to move into jobs created in new industries. Unemployment Rate is the percentage of people in the labour force who are without jobs and are actively seeking jobs. Natural Rate of Unemployment is the proportion of workforce that is unemployed for reasons other than cyclical. At full employment, the actual rate of unemployment is equal to natural rate of unemployment. (Cyclical unemployment = zero). A correlation between inflation and unemployment is depicted in Phillips Curve. According to the curve, an inverse relationship exists between rate of inflation and unemployment in short run. The rationale was that low unemployment was associated with high aggregate demand, which in turn puts pressure of price and wages on the economy. All policymakers face tradeoffs and decide whether low inflation or unemployment is the priority. Exchange rate (also known as the foreign-exchange rate, forex rate or FX rate) between two currencies specifies how much one currency is worth in terms of the other. The spot exchange rate refers to the current exchange rate. The forward exchange rate refers to an exchange rate that is quoted and traded today but for delivery and payment on a specific future date. The nominal exchange rate is the rate at which an organization can trade the currency of one country for the currency of another. The real exchange rate (RER) is an important concept in economics, though it is quite difficult to grasp concretely. It is defined by the model: RER = e (P/P*), where ‘e’ is the exchange rate, as the number of foreign currency units per home currency unit; where P is the price level of the home country; and where P* is the foreign price level. If a currency is free-floating, its exchange rate is allowed to vary against that of other currencies and is determined by the market forces of supply and demand. Exchange rates for such currencies are likely to change almost constantly as quoted on financial markets, mainly by banks, around the world. A movable or adjustable peg system is a system of rates, but with a provision for the devaluation of a currency. A market based exchange rate will change whenever the values of either of the two component currencies change. A currency will tend to become more valuable whenever demand for it is greater than the available supply. It will become less valuable whenever demand is less than available supply. Like the stock exchange, money can be made or lost on the foreign exchange market by investors and speculators buying and selling at the right times. Currencies can be traded at spot and foreign exchange options markets. The spot market represents current exchange rates, whereas options are derivatives of exchange rates. The balance of payments (or BOP) measures the payments that flow between any individual country and all other countries. It is used to summarize all international economic transactions for that country during a specific time period, usually a year. The BOP is determined by the country’s exports and imports of goods, services, and financial capital, as well as financial transfers. It reflects all payments and liabilities to foreigners (debits) and all payments and obligations received from foreigners (credits). The Balance of Payments for a country is the sum of the Current account, the Capital account, the Financial Account, and the change in Official Reserves. The current account is the sum of net sales from trade in goods and services, net factor income (such as interest payments from abroad), and net unilateral transfers from abroad. Positive net sales from abroad correspond to a current account surplus; negative net sales from abroad correspond to a current account deficit. Because exports generate positive net sales, and because the trade balance is typically the largest component of the current account, a current account surplus is usually associated with positive net exports. The capital account used to entitle the section now familiarly known as the financial account. This section usually includes special debt transactions between nations and migrants’ goods as they cross a country’s borders. The official reserve account records the government’s current stock of reserves. Reserves include official gold reserves, foreign exchange reserves, and IMF Special Drawing Rights (SDRs). Reserve accounts typically are dominated by monetary authority intervention in the official currency’s exchange rate. Countries who try to control the price of their currency will have large net changes in their Official Reserve Accounts. Some of the most extreme examples include China and Japan. Japan in particular recently had a change in its reserves approximately one half of the entire net reported Balance of Payments. The financial account is the net change in foreign ownership of domestic assets. If foreign ownership of domestic assets has increased more quickly than domestic ownership of foreign assets in a given year, then the domestic country has a financial account surplus. On the other hand, if domestic ownership of foreign assets has increased more quickly than foreign ownership of domestic assets, then the domestic country has a financial account deficit. The accounting entries in the financial account record the purchase and sale of domestic and foreign assets. These assets are divided into categories such as Foreign Direct Investment (FDI), Portfolio Investment (which includes trade in stocks and bonds), and Other Investment (which includes transactions in currency and bank deposits). A country will have a negative balance of payments (a net decrease in official reserves) if the net of the current account and the capital account is a deficit. Similarly, there will be a positive balance of payments (a net increase in official reserves) if the net of the current and the capital account results in a surplus. The balance of trade (or net exports, NX) is the difference between the monetary value of exports and imports in an economy over a certain period of time. A positive balance of trade is known as a trade surplus and consists of exporting more than your imports; a negative balance of trade is known as a trade deficit or, informally, a trade gap. The balance of trade forms part of the current account, which also includes other transactions such as income from the international investment position as well as international aid. If the current account is in surplus, the country’s net international asset position increases correspondingly. Equally, a deficit decreases the net international asset position. The trade balance is identical to the difference between a country’s output and domestic demand (the difference between what goods a country produces and how many goods it buys from abroad, this does not include money re-spent on foreign stocks, nor does it factor the concept of importing goods to produce for the domestic market). Fiscal policy is defined as the deliberate change in government spending, government borrowing or taxes to stimulate or slow down the economy. Fiscal policy is an effective tool through which the government may influence the level of economic activity. Mostly developing countries like Bangladesh predominantly use fiscal policy in order to achieve economic objective with precision and efficiency. There are broadly two phases of policies implemented in various conditions. These are 1) expansionary fiscal policy 2) contractionary fiscal policy. Expansionary fiscal policy occurs when government fiscal revenue is less then expenditure, thus causing a budget deficit. Contractionary fiscal policy occurs when government revenue is more then expense thus causing a budget surplus. For example, during periods of high economic growth, a budget surplus can be used to decrease activity in the economy. A budget surplus will be implemented in the economy if inflation is high, in order to achieve the objective of price stability. The removal of funds from the economy will reduce levels of aggregate demand in the economy and contract it, bringing about price stability. The benefits of fiscal policies are advocated mainly by Keynesians and rejected by Classical economists. Keynesian View: They consider the economy to be operating with huge unused capacity. Keynesians look to stimulate the economy by influencing the aggregate demand. This will allow the economy to run at a higher growth rate with low level of unemployment, thus helping the economy to recover from slump. If the economy is nearing full employment, fiscal policy may fail to generate desired growth and push inflation rate to an undesirable level. Classical View: Classical economists consider economy to be fully employed with no unused capacity. So according to them, expansionary fiscal policy will cause only rise in price level with no corresponding rise in output. This actually is a far cry from actual scenario where spare capacity in the economy is a common phenomenon. The regulation of the money supply and interest rates by a central bank, such as the Bangladesh Bank., in order to control inflation and stabilize currency constitutes monetary policy. The main intention of monetary policy is to gain quick result on improving current macroeconomic conditions. Monetary polices are mainly championed by monetarists. These economists suggest that inflation is a monetary phenomenon. Monetarism is an economic theory which focuses on the macroeconomic effects of the supply of money and central banking. Formulated by Milton Friedman, it argues that excessive expansion of the money supply is inherently inflationary, and that monetary authorities should focus solely on maintaining price stability. Interest rate is the focal point of all policies as indirectly, interest rate will be affected by all the policies. Interest rate is usually dictated by the central bank. However, in Bangladesh the government does not try to fix the rate of interest. Open market operations look to influence the money supply rather directly. If the government intends to alter money supply, it engages in buying and selling bonds or government securities. If government wants to combat inflation, it sells bonds to general public. This will reduce the supply of money and increase rate of interest. Higher interest rate in turn will help to dampen aggregate demand and stem growth level and inflation in the economy. 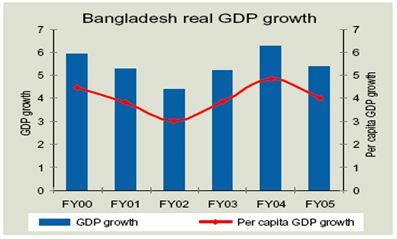 It can be seen from the above graph that Bangladesh’s GDP growth has remained around 4 percent. Many factors are contributing to the steady growth, the most important being the ready-made garment (RMG) industry, which has proved to be the power wheel of Bangladesh economy. Other important factors include increase in exports, higher level of savings and investment, and increase in aggregate demand of products in the economy. Growth of GDP during mid nineties was based on rise of investment growth, both public and private. This resulted in substantial acceleration of GDP growth. From 1999 to 2001, investment growth declined due to decline of private investment. But growth of public investment continued, as a result agricultural growth accelerated producing an acceleration of overall GDP growth. This decline in private investment, and hence overall GDP was due to political instability. But after the elections of 2001, the newly elected government adopted expansionary fiscal and monetary policies to boost employment and growth. As a result GDP growth started rising from FY2002. GDP growth continued rising well in FY2004, supported by huge increase in production in the agriculture, industry, and service sector. But in August of that year, Bangladesh was hit by the worst flood in six years. The colossal losses of crops due to the devastating floods caused GDP growth in FY2005 to fall to about 4%. The unfavorable condition was further aggravated by political unrest. However, economists opine that the attainment of such a growth rate despite the various constraints demonstrates fundamental resilience of the economy. The growth in GDP has been accompanied by an increasing trend in per capita GDP and GNI growth. In FY2004-05, per capita income has been $470, which is 9.66 percent higher than that of the previous fiscal year. During the same period, per capita GDP had increased by 9.22 percent. But focusing on per capita GDP and GNI alone to deduce standard of living will not be correct. An analysis of the overall improvement in standard of living should also take into account measures such as Poverty Incidence, Human Development Index (HDI), Human Poverty Index (HPI), and the Gini coefficient. Almost 50% of Bangladeshi are poor (earning less than $2 a day), and 30% extremely poor (earning less than $1 a day). In the past decade real GDP grew by 60 percent, translated into average GDP growth of 3 percent per capita. This growth in GDP was accompanied by a modest 9 percent decrease in the incidence of poverty. Although this improvement is heartening, the overall poverty incidence still remains very high at 50 percent. On the other hand, income inequality rose considerably over the same period. Inequality in the distribution of private per capita expenditures, as measured by the Gini coefficient, increased from 0.259 in 1991-92 to 0.306 in 2000. Most of the observed increase in inequality took place during the first half of the 1990s. Urban inequality increased much more than rural inequality during this period. Decomposing the national Gini coefficient by sector suggests that the increase in the national Gini was due not only to rising inequality within sectors, but also to rising inequality between the urban and rural sectors. However, there has been some improvement of Bangladesh in the HDI metric. In 2004, Bangladesh ranked 137 in the HDI scale and had a HDI value of 0.530, compared to the rank of 139 and a HDI value of 0.520 in 2003. Labor market situation in Bangladesh is fragile as high population growth continues to expand the economically active population and privatized industries simultaneously lay off employees. Relatively high rates of inflation combined with high levels of unemployment may lower real wages. The government has not taken enough initiatives to create job opportunities and set up new industries to overcome these problems. According to Bangladesh Labor Force Survey 2002-03 conducted by BBS, a labor force (above 15 years) of 4.43 crores (male 3.45 crores and female 0.98 crores) is engaged in a variety of professions. Agriculture accounts for 51.69% of employment; industry, 13.56%; and services, 26%. It is observed that highest 44.70% labor force is engaged in self-employment. 20.09 % of labor force was engaged as daily laborers and 13.77% as full time employed workers. 18.28% of labor force was engaged as unpaid family laborers. It is massive challenge for Bangladesh to find work for over 2 million people who enter the labor force every year. Most of them engage in self-employment in low productive areas of the non-formal sector. According to the Labor Force Survey carried out in 1995/96, the unemployment rate is 2.5%. However, this value grossly underestimates the actual unemployment rate and ignores underemployment rampant in the economy. Some experts suggest that the actual unemployment rate may be as high as 40%. The garments industry, which has absorbed a large proportion of the population entering the labor market, especially females, seems to have become oversaturated. During recent years, the overseas job market employed about 250,000 Bangladeshis annually, and their remittances constituted about 4 percent of GDP. However, overseas job opportunities seem to be declining. Rural unemployment rate is considerably higher than urban areas. However, overall unemployment rate seems to be declining because more opportunities are created as huge amounts of investments are made in the country. After taking office in 1991, the BNP government established accountability in all aspects and forced bank defaulters to repay loans. Many defaulters did not comply, keeping their expenditures aside. However, inflation rate actually declined. Due to pressures from IMF and World Bank to establish a free market, the government started to take a liberal attitude towards the market. An open market economy was established and this had a major influence on inflation. Due to trade liberalization, import became cheaper compared to price level of consumer goods. As a result, volume of imports increased while real demand at home decreased. With exchange rate fairly stable, these led to a further reduction of inflation rate. But these also caused a decline in local production. Cottage industries suffered and unemployment increased. In 1993 Bangladesh had a bumper ‘aman’ crop. This reduced the import of food grains, and the price of staple food declined. Since agri products have a greater weight age in the calculation of Consumer Price Index (CPI), decline in the price of food grains caused a reduction in inflation. During 1993 and 1994 production in mills and factories increased uninterruptedly due to political stability. This caused the rate of inflation to decrease even further and in early 1994 Bangladesh had the lowest inflation rate of 1.8% among all the SAARC countries. However, in May 1994 the government raised the salaries of government officials by 5%. Since the raise in salaries was not accompanied by any increase in productivity, the economy experienced cost push inflation. By the end of 1994 the rate of inflation was at 4%. Political stability was short lived. Instability in the political arena began from 1995. The siege of the Chittagong port led to a shortage of imported goods in the local market. As a result, prices of commodities went up, and by the middle of 1996 the rate of inflation had increased significantly. During the five years the price level overall was under control. The main hindrance was not fiscal or monetary policy but political instability and corruption. The Awami League government managed to bring inflation down immediately after taking office. In 1996, the rate of inflation was 2.52%. The Awami League government followed a strict policy of keeping inflation rate low. Whenever commodity prices showed a rising trend the government engaged officials in spot-buying to increase supply. Even when cereal prices threatened to rise sharply in 1997, the government managed to keep it under control. In 1998 Bangladesh suffered from one of the worst floods ever. Almost two-thirds of the country was under water for about 2 ½ months, causing serious shortages of all commodities. But the government acted swiftly, importing 4 million tones of food grains within 2 months. This prevented double digit inflation. In the years 1999 and 2000, the country experienced good production, which resulted in inflation to dip below 5%. The bumper harvest in agriculture definitely helped bring inflation under control. Despite the devaluation of taka, inflation did not rise significantly. In the last budget, the government, contrary to tradition, did not raise the price of goods and commodities. Consequently, people of the lower income bracket did not face economic hardship. After the 2001 elections, the B.N.P led four party alliance came to power. At that time, inflation rate was below 2%. This was largely due to a bumper ‘aman’ crop. The government prioritized economic growth and attaining surplus in the balance of payment. But the ill-fated event of 11th September 2001 completely changed the economic scenario. The USA and the rest of the developed world fell into recession. This caused exports to fall and the economy was dealt a severe blow. By the year 2003-2004, the rate of inflation rose to around 5 percent. This was because the government adopted expansionary fiscal and monetary policy to boost employment and economic growth. The economy grew by 6%, but it caused inflation to rise at a faster rate. In 2003, the Iraq War caused the price of oil to shoot to above $60 a barrel. This caused inflation to set in the economy. The agricultural sector was one of the hardest hit because it depended on diesel to run motors for irrigation. Consequently, the price of agricultural products rose. Since agri products have a greater weight age in the calculation of Consumer Price Index (CPI), the inflation rate rose further. In later years, the volume of imports rose, driving the value of the local currency down. Consequently, the price of imported raw materials rose up, giving rise to another round of inflation. The period was therefore marked by relatively higher inflation rates. One of the prime factors responsible for the higher inflation rates was hoarding by dishonest businessmen. They formed syndicates and stocked essential goods causing an artificial crisis. Many blamed the government for failing to rein down on such individuals. During 2004, inflation was caused by supply side factors. It began with severe deluge that reduced local supply of food grains sharply. This was followed by rise in international price of food items including rice, wheat, sugar etc. The sharp rise in oil price and consequent adjustment in domestic oil price also contributed to inflationary trend. In 2006, to ease pressure on fiscal and external balances, the government took a number of measures like increasing interest rate, controlling import and caused slow down of economy. The government also took measures to raise tax revenues by charging indirect taxes in the form of VAT. All these meant even higher inflation rates. Two measures are used to illustrate the savings pattern in Bangladesh: gross domestic savings and gross national savings. Gross national savings is equal to gross domestic savings (gross domestic product minus total consumption) plus net income and net current transfers from abroad. The graph below illustrates the trends in changes in savings from 1996 to 2006. Bangladesh’s savings rate has experienced a steady and substantial rise over the past decade. Bangladesh’s gross national savings has increased from Tk.25448 crores or 17.78% of national disposable income (NDI) in FY1993-94 to Tk.110758 crores or 25.03% of NDI in FY2005-06, which amounts to an average annual growth of almost 12%. Bangladesh’s gross domestic savings has increased from Tk.17744 crores or 13.10% of GDP in FY1993-94 to Tk.84331 crores or 20.26% of GDP in FY2005-06, which amounts to an average annual growth of 12.74%. This steady growth in savings has been a result of rising interest rates and the government’s increased borrowing from non-bank sources in the form of saving certificate. High interest rates have been a result of poor competition between commercial banks and inefficiencies in the sector. However, the former Bangladesh Bank Governor Dr. Fakhruddin Ahmed has discounted the logic that high bank rates lead to higher deposits. He claimed that if things were so, savings should have been higher since for the last several years banks have had high deposit rates in real terms. Bangladesh’s savings rate took off in the early 1990s, after the newly democratically elected government undertook liberalization of the economy. Significant policy changes were also implemented by the Bangladesh Bank, especially, policies toward achieving macroeconomic stability and an efficient money market in the country. As part of these changes, commercial banks were allowed to set the interest rates (i.e., lending and deposit rates) in line with market conditions, which were previously determined by the Bangladesh Bank. The reforms and liberalization effort caused the corporate sector to become profitable, which in turn caused savings in the private sector to increase. However, low level of savings or dissavings in the public sector caused the saving rate to be low compared to other countries of comparable per capita income. From FY1998-99 to FY2002-03, domestic savings were stagnant at around 18% of the GDP, which indicated very little savings by poor and rural people. Due to cost push inflation, the poor were more affected, as the rural price hike, especially of food items, was higher than urban price increases. As they had to spend more due to price hike, the poor and rural people saved little. National savings has always been higher than domestic savings because of remittances sent by Bangladeshi workers from abroad. Remittances have also been an important contributory factor in raising the level of national savings. The government extends incentives to all expatriate Bangladeshis to send back some of their savings. They are granted a preferential exchange rate, and a portion of their remittances can be turned back into foreign currency for purchases from abroad. In the above table, the total investment scenario of Bangladesh for the past eight years is provided. The data indicates that gross investment has steadily increased over the period under consideration. From FY1997-98 to FY2000-01, gross investment rose from 9524 million USD to 10848 million USD. This was possible due to uninterrupted production, low inflation and renewed business optimism. The period also enjoyed less frequent strikes which encouraged people to invest more money in their business. 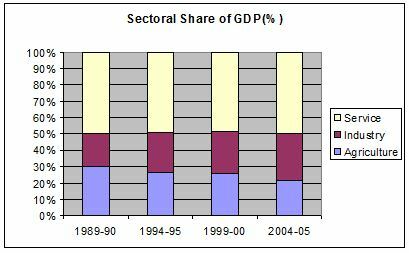 Gross investment was 21% of GDP in the year 1997-1998. While the figure rose of 24.4 in the year 2004-2005. The gross investment-GDP ratio stagnated around 23% because of the disastrous floods in 1998. This caused immense loss for the economy due to loss of valuable assets and lead to stagnating investment. On the other hand, public investment figure actually declined as percentage of GDP. This percentage figure was 6.4% of GDP in the year 1997-1998, while it fell to 5.9 % in the year 2004-2005. It should be noted that the level of investment in the economy of Bangladesh is poor compared to other economies of comparable per capita income. A developing economy like Bangladesh needs to plough back more then 40 % of the GDP for investing. A key issue is the dominant effect on the investment level of the level of interest rate in the economy. Level of interest rate alters the cost of capital and required return on investment higher interest rate reduces investment while lower interest encourages investment. Between the fiscal years 2003-2004 to 2004-2005, the rise of private investment was not high enough. This was because during this time, rate of interest was increased to curb inflation. Therefore, higher interest slowed down the overall rise in the level of investment. Another key issue is that the rate of investment is low compared to the rate of saving, which indicates that there is insufficient capitalization of savings. The only exception occurred in FY2000-01, when investment exceeded savings. The gap between savings and investment is a result of increased government borrowing from private savings in the form of saving certificates. Trade balance recorded a deficit of US$ 3,297 million during 2004-05 compared to deficit of US$ 2,319 million during 2003-04. The current accounts balance recorded a deficit of US$ 518 million during 2004-05 against the surplus of US$ 176 million over previous year. The current account balance showed a deficit despite a 14.61 percent increase in current transfers compared to previous year because of a 42.14 percent decrease in trade account and 71.39 percent decrease in income account. The overall balance showed a surplus of US$ 161 million during 2004-05 compared to the surplus of US$ 171 million during 2003-04 due to mainly a remarkable surplus in financial accounts of US$ 744 million, particularly for MLT loans of US$ 940 million. The current account balance has had some diverse experience throughout the 1990s. At the beginning of the decade (FY92), Bangladesh had a negative current account balance of (-) $118 million which reached to (-) $1291 million in the beginning of the second half (FY96) due to a huge negative trade balance of (-) $3063 million due to the large volume of imports from abroad. It is notable to mention that in FY96 Bangladesh observed the highest negative trade balance during the last one and half decade. The current account balance has witnessed some improvements by the end of last decade and enjoyed small but positive balance of $2 million. On the other hand, in FY01, Bangladesh experienced a negative balance of (-) $1019 million in its current account. In FY03, the current account balance amounted to a positive sum of $328 million which facilitated the overall balance of payments to reach a positive amount of $815 million by the end of the said fiscal year. Bangladesh pursued a flexible exchange rate policy for over a period of more than ten years. Formerly, exchange rate of taka were adjusted from time to time for keeping it competitive based on inflation rate and movement of exchange rates as well as trade weights with partner countries. However, recently the government has taken a bold step in exchange rate management. Since May 31, 2003 Bangladesh introduced a fully market based exchange rate. Introduction of free float exchange rate has not brought any significant instability in the economy so far. The US dollar remained stronger against Taka during late 2003 through April 2004. The situation after that did not aggravate and Taka remained stable during May 2004 to August 2004. Since August 2004 Taka showed stability. From August 2004 to March 2005 Taka showed some resilience against US dollar. Rapid development of private sector, much higher growth in import of capital machinery and primary goods due to devastating flood, and oil price hike in international market were mainly responsible for the main reason of adverse situation of exchange rate. However with continued monitoring and supervision by the central bank and also due to injection of dollars back into foreign exchange market the exchange rate turned stable. On June 30, 2004 the official and inter bank market Taka-Dollar exchange rate remained stable between Taka 59.30 and Taka 61.50 respectively. Although the exchange rate was a little bit higher in open market compared to inter bank market, stability still existed. After that the rate was moving between Tk. 61 to Tk. 62.20 in the market. However the currency depreciation continued. The exchange rates of Taka for inter-bank and customer transactions are set by the dealer banks themselves, based on demand-supply interaction. The Bangladesh Bank is not present in the market on a day-to-day basis and undertakes purchase or sale transactions with the dealer banks only as needed to maintain orderly market conditions. As of 12th February 2007 Exchange Rate was Tk. 69 against US $1. Growth of export earning and remarkable increase of remittance from expatriate Bangladeshis caused foreign exchange reserve to rise to US$ 2,705 million on June 30, 2004 from US$ 2,470 million, implying 9.51 percent growth over the same date of previous year. As of June 30, 2005 the foreign exchange reserve stood at US$ 3,024 million. The main sources of revenue collection are import duty, VAT, supplementary duty, excise duty and most importantly: income tax. Other non tax revenue sources are income form public corporations and interest from government held financial instruments. Bangladesh has repeatedly failed to meets its revenue collection targets from FY2001-02 to FY 2004-05. In FY 2001-2002, the actual collection was Tk 27893 crores against the target of Tk 28456 crores, indicating that the collection was 2 percent less then the target. According to the revised budget of FY 2004-2005, the target of revenue collection was Tk 39200 crores against which the actual revenue stood up to Tk 33713 crores. In the FY 2004-2005 the revenue as a percentage of GDP rose to 10.64 percent. The table indicates that the development expenditure has actually decreased over the years. This is an alarming trend since Bangladesh requires mammoth investment in infrastructure development in order to attract investments. The budget deficits arose because of the government’s inability to collect satisfactory tax revenue. The deficits were financed by loans from both foreign and domestic banks, and grants and soft loans from donor countries. Financing also came from selling government securities or treasury bills. The government of Bangladesh feels more comfortable dealing with fiscal rather then monetary policy. Therefore, monetary policy plays a rather subdued role in the overall macroeconomic decision making. In the decades of seventies and eighties, monetary policy in Bangladesh was conducted with direct control on interest rates and exchange rates, as also on the volumes and directions of credit flows. The situation began changing in the nineties with the abolition of directed lending and gradual liberalization of interest rates; the change process culminating in transition to market based exchange rate of Taka from 31st May 2003. From then on, interest rate and exchange rate are both market driven, exchange rate is no longer in the role of nominal anchor for prices. Monetary policy in Bangladesh is formulated around inflation and output growth rates as the basic policy targets. Levels and growth paths of relevant monetary aggregates such as reserve money, broad money and domestic credit are also projected and monitored as intermediate targets in conducting monetary policy. The diagram below illustrates the weighted rate of interest for the last five years. The higher growth of domestic credit compared to broad money is encouraging in a sense that the economy is growing due to rise in the overall level of investment in the economy. Higher credit also indicates lower level of interest and high consumer optimism. The overarching goal of Bangladesh’s economic and social development is poverty alleviation, which can only be achieved by expanding output. Expansion of output is only possible through more investment, hence more savings. The government should design appropriate macroeconomic policies that would promote the expansion of public and private savings and help the transmission of these savings into productive investment and improving the overall efficiency. The government should also readjust the rate of interest. Relatively high and lucrative interest rate for depositors will encourage savings in the economy. The gap between interest for depositors and lenders must be minimized. This will be possible if the banks are prepared to sacrifice their profit margin. The government should also create separate savings schemes for small savers, pensioners, and disadvantaged groups. This will lead to a great leap in the volume of savings. Tackling high unemployment remains a challenge for Bangladesh. The government should create job opportunities and should take initiative to run industries. Within the policy of privatization, the government may take different steps towards creating jobs and running industries. Corporate tax should be minimized to encourage corporations to invest more money as they would be able to retain larger part of their profit. Low corporate tax will also encourage many entrepreneurs to set up business along with attracting more FDI. Higher level of investment in different sectors will create new employment opportunity for the working population. But pursuing high growth and employment will inevitably give rise to higher rates of inflation. A certain level of inflation is always desirable for a healthy economy. Something around 5% would be an ideal inflation rate in an economy. But, Bangladesh is currently experiencing inflation rate of 7.09%. So, controlling inflation rate will be a challenge for the next democratically elected government. There must be arrangements to hold the price level of the economy within the toleration limit of the mass people and to keep the economy stable. Only by dealing with inefficiency and corruption severely can the government achieve reasonable amount of price level of goods. To curb repeated budget deficits, the government should focus on meeting its targets for collections of tax revenue. The government should crack down on tax avoidance and tax evasion. The continued borrowing from Bangladesh Bank to finance the budget deficit should also be curbed to reduce the gap between savings and investment.